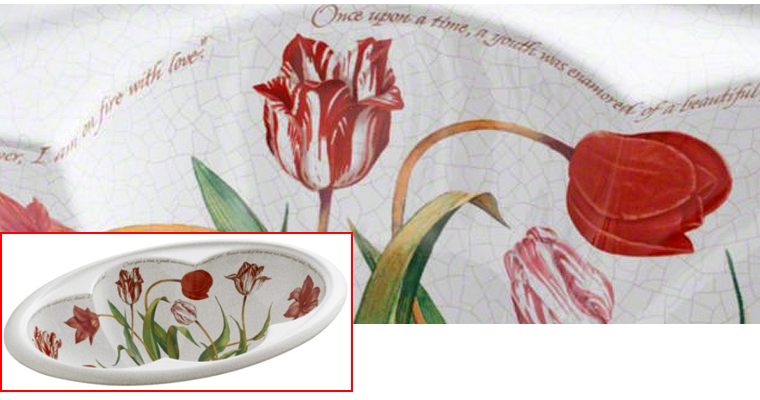 Inspired by 17th century English artwork, the Fables & Flowers design on the K-14173 Cantata bathroom sink features tulips in shades of red, pink, and white on a crackled white background. Once upon a time, a youth was enamored of a beautiful girl. Rumor reached him that his beloved had died. Mounting his horse, he galloped off the edge of a rocky escarpment, meeting death instantly. As blood seeped from his wounds, bright red tulips sprang up all around. Thus the red tulip became a declaration of love. A tulip offered by a young man to his beloved says, "as the redness of this flower, I am on fire with love."